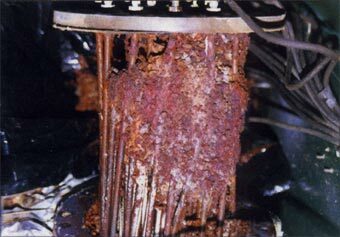 A typical example of common water system problems seen on this potable hot water electric heat exchanger. Then after 6 months of treating with the ProgressiveEnviro.com's electonic, chemical free, eco-friendly water descaling treatment system. You can see the scale has been removed and the system can now work more efficiently and less downtime will occur in the future. and remove existing scale for system components. Most process water contains impurities. 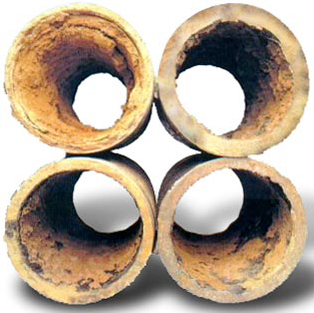 Mineral deposits from impurities build up on the interior surfaces of process water piping and on heat transfer surfaces. This is called scale. It reduces total water flow, decreasing machine efficiency and causing increased maintenance cost and downtime. 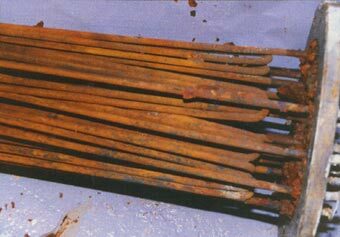 Additionally, other solids and bacteria from many sources attach to the scale and contribute to the fouling of process equipment. Hard water substantially increases energy consumption, necessitates equipment downtime for cleaning and results in the early renewal of capital equipment. Executives involved in running a business, local government department or institution are under increasing pressure to cut costs and become more efficient. However this must be carried out with due regard to increasing environmental legislation. Treating process water to reduce mineral impurities may be accomplished either by ion exchange (soft water), changing calcium hardness to sodium, or by adding ions to Calcium and Magnesium particles (electronic descaler) thereby prohibiting mineral limescale buildup and promoting the removal of existing scale. ProgressiveEnviro.com's safe, green, chemical free water treatment system enables companies to save money and costly downtime due to scale buildup. ProgressiveEnviro.com - 1.800.491.5815 - offers chemical free water treatment solutions for business and industry in many states and locations: OH-Cleveland, Columbus, Cincinnati, Western NY-Buffalo, Rochester, Western PA-Erie, Rochester, WV-Parkersburg, Charleston, Huntington, KY-Louisville, Lexington, IN-Ft.Wayne, Indianapolis, South Bend, IL-Chicago, MI-Detroit, Lansing, NC-Charlotte, Winston-Salem, Raleigh-Durham, SC-Greenville, Columbia, GA-Atlanta, Augusta, TN- Knoxville, Nashville, Chattanooga, FL-Orlando, Tampa-St.Petersburg, Miami, Jacksonville, TX-Dallas-Ft.Worth, Houston, San Antonio, Austin. Electronic water conditioners that descale water reclamation flows are environmetally safe and easily installed. Chemical free water treatment systems save money. Hard water treatment systems come in many types. For example, ProgressiveEnviro.com can custom design a chemical free water treatment system for your specific need or work within your existing non-chemical cooling tower water treatment setup and offer replacement service or redesign. We listen first to our customer's needs and then propose a descaling technology solution that fits expectations.